Electronic Remittance Advice (ERA) are built seamlessly into your EHR and workflow; no separate software required. 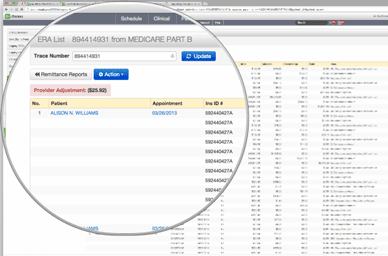 In addition to one-button reporting, you can filter ERA’s for more robust reporting. No need to make trips to the bank, your ERA payments are posted straight into your practice’s bank account via direct deposit (ACH).